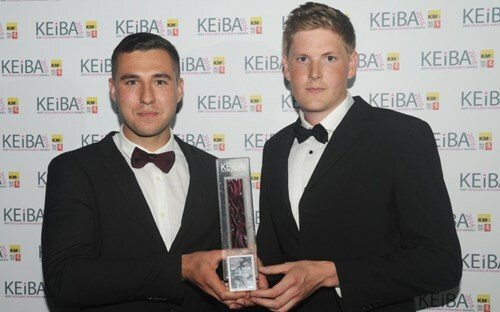 Aero Legends Ltd have been named Start Up Business of the Year at the Kent Excellence In Business Awards. On the 23rd of June, nearly 600 guests came to the gala dinner at the Kent Showground in Detling to see who would win the 15 categories. “Sue and Keith Perkins started the business with the idea of being able to provide access to Spitfires,” said Mr Styles. “It is such an iconic aircraft for what it had done in the Second World War and we are dedicated to keeping the memory of the fallen alive. Those young pilots gave their lives for the freedom we enjoy today. Ben Perkins and Elliot Styles collect the award for Aero Legends Ltd at the gala dinner. The premier provider of Spitfire flight experiences in the UK!